The events began with half of the students attending five of the sixteen, 15-minute presentations with other half of the students interacted with presenters at three of the sixteen, 25-minute hands-on workshops – learning about the irreplaceable resource of water and its characteristics. The Ohio WRC led one of the 25 minute workshops teaching the attendees about buoyancy and used interactive examples to describe why some things float and some things sink in the water. The Center demonstrated different examples of buoyancy and how it relates to density. Each group was broken into three teams and given the challenge to determine if given items would float or sink based on the principles of buoyancy. Finally, the presentation ended with a quick lesson on paper boat-making followed by a quicker (sometimes) fun competition to sink their paper boats with metal washers. Photo above, L-R (in red Water Festival shirts): Ohio WRC Co-Director, Dr. Linda Weavers, and Associate Director, Zuzana Bohrerova, demonstrate buoyancy. Dr. Tim Wolfe, Stantec, one of the original organizers of the Festival. Columbus DPU, Ohio EPA, Brown and Caldwell, City of Columbus Parks and Recreation, Columbus Fire Department, Columbus Metro Parks, Columbus Public Health, Franklin Park Conservatory, Franklin Soil and Water Conservation District, ODNR/Watercraft, Ohio Wildlife Center, OSU Extension, OWEA/Stantec, Scioto Audubon Center, Sierra Club, Water for People and Westerville Water. Photo above: Suprith and his teacher accepting First place from Councilmember Stinziano for the Window-cling contest. Before lunch, the students were formally welcomed to the Central Ohio Children’s Water Festival by Columbus City Council member Michael Stinziano, DOW Assistant Administrator Danella Pettenski and Festival Co-Coordinator Lorraine Krzyzewski (DOW) – DPU Director Tracie Davies was in attendance supporting her staff. Councilmember Stinziano announced Suprith Sardashan of Shepherd Christian School as the winner of the window-cling contest and called Suprith and his teacher to the stage for recognition. Suprith’s slogan was, “No amount of money can outrank the value of water.” The Councilmember also acknowledged DOW’s tapping team and their quick demonstration for helping the students understand how drinking water travels from the water treatment plants to pipes beneath the street and into their homes and imparting how vital this infrastructure is. Lorraine Krzyzweski, Columbus DOW, and Luke Murry, Stantec, Michelle Eckels, Resource International, Jeff Montavon, Ohio EPA, and Summer Hawkins, Columbus DOW, Jamie Decker, CH2M, Cindy Jacobsen, T&M Associates, Kristen Atha, AECOM, Amy Eberhardt, ARCADIS, Anne Speakman, Ohio EPA, Erika Rowland and Elizabeth Veljanoski, Franklin Soil and Water Conservation District. 360 Water, AEC, AECOM, ARCADIS, B&N, Black & Veatch, Brown & Caldwell, CDM Smith, City of Columbus, CH2M, CHA, CT Consultants, DHDC, DLZ, Dynotec, EMH&T, GPD Group, Gresham Smith, Hatch, Hazen, HDR, HR Gray, Key Blueprint, Kokosing, MS Consultants, OHM, OWEA, Pelton Environmental, Prime Engineering, Ranney Collector Wells, Resource International, Ribway, Smith Environmental, Smoot, Stantec, Strand, T&M, Williams Creek and Woolpert. 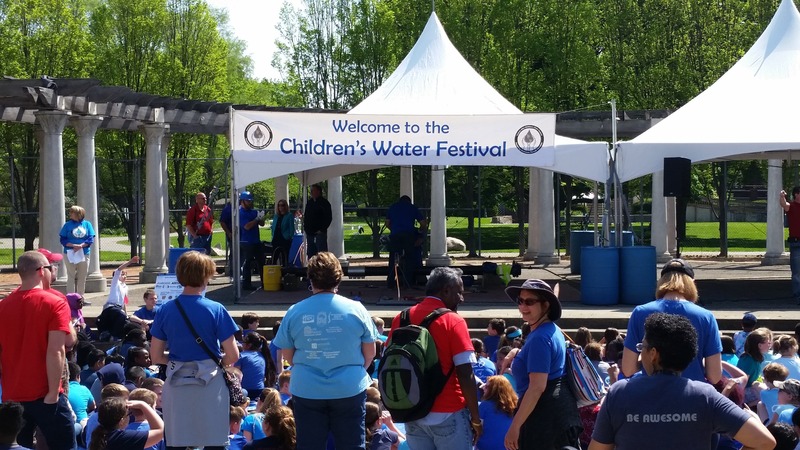 Thanks to everyone who contributed in some fashion to yet another successful Central Ohio Children’s Water Festival. Thanks you to Laura Young Mohr who provided photos of the day’s events. A special thanks goes to Columbus DPU Director Tracie Davies and DOW Administrator Rick Westerfield whose unwavering support has led to the long-term success of this valuable educational event for Franklin County school children.